Sometimes you hope fabric and pattern design work out, and you end up with a winner. This is a winner, in my books. The fabric is from my stash, and again, it’s from EmmaOneSock’s roll end page. 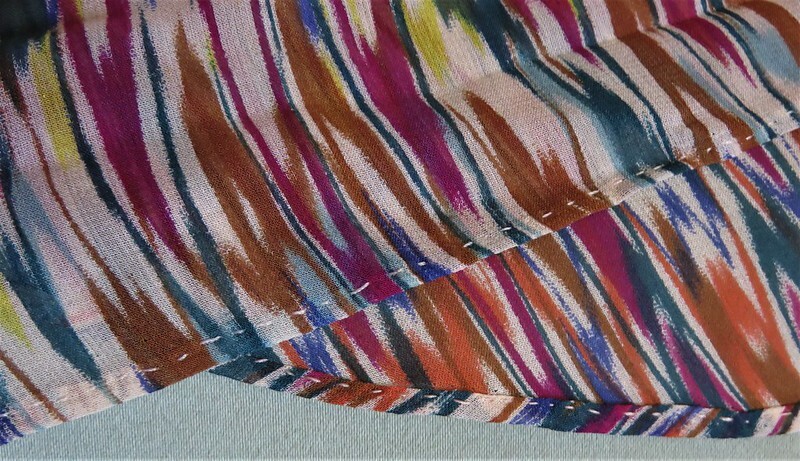 It’s a lovely silk chiffon with a myriad of colours – my favourite fabric for tops because they will coordinate with any number of bottoms, colourwise, anyways. 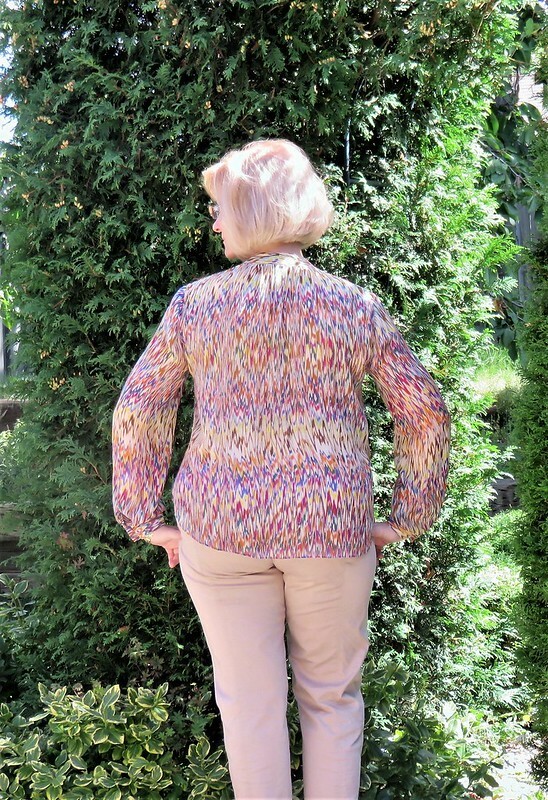 There’s only two reviews for this blouse (View B) on Pattern Review, and I cannot figure out why. Maybe the style isn’t for everyone, or the pattern version is off-putting? Anyways, I love my version! I did find the instructions for the front a little bit confusing the first time I read through them, but I told myself that if I can decipher BurdaStyle’s cryptic English translations, then I could do this. Here’s the inside of the front before the folding, buttons and buttonholes have been completed. I used silk organza for a stabilizer, something Vogue doesn’t suggest, which is ridiculous if you’re adding buttons and buttonholes. This is what the front looks like once it’s all been completed while being worn. I did a sloped forward shoulder adjustment and an FBA. And I’m pretty chuffed about how I managed to match the bands of colour for this top. There were literally unusable scraps left. Oh, and the trousers are the first pair of the slim Burda 01/2016 #135 trio that I made; this pair is made from a stretch cotton sateen purchased at my local Fabricland. I absolutely love the quality of this fabric. 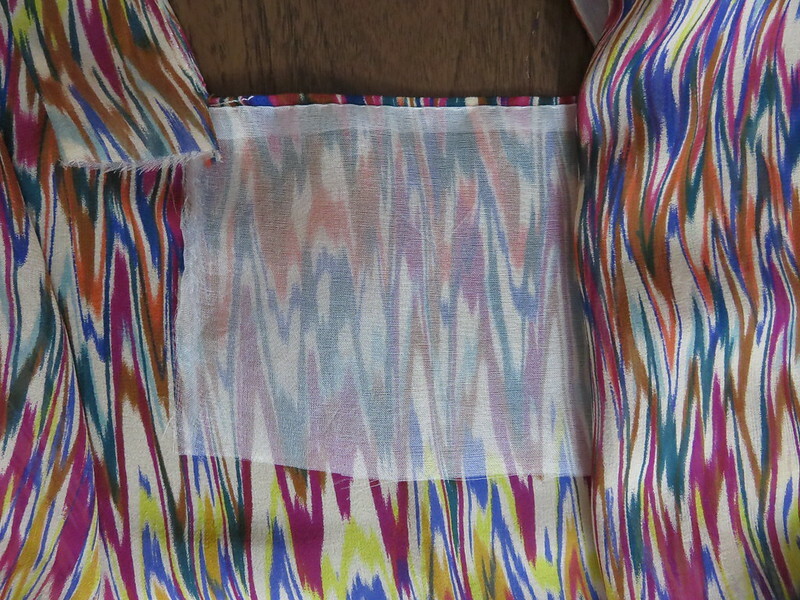 And, just because I hated the samples of the machine-stitched narrow hem, I did this shirt by hand. Still need a lot of practice, even if this is macro shot! Oh my, beautiful fabric and your covered buttons and the hemming are lovely. I don’t have the patience nor the ability to do a lot of handsewing. My hands tend to seize up! Love, love it! I have this pattern in my stash, just haven’t gotten to it yet. I’m sooo slow. 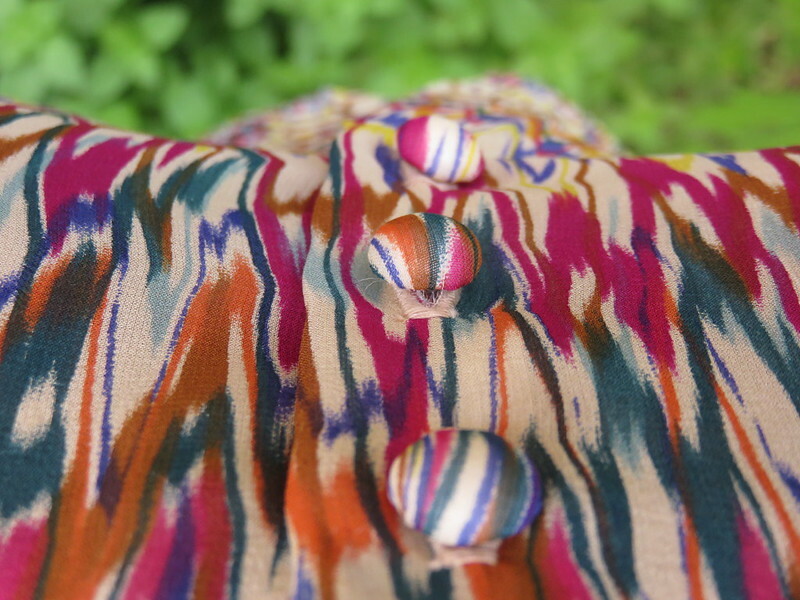 Chiffon can be a challenge to work with, but it made such a lovely blouse. I love the colors in the print. 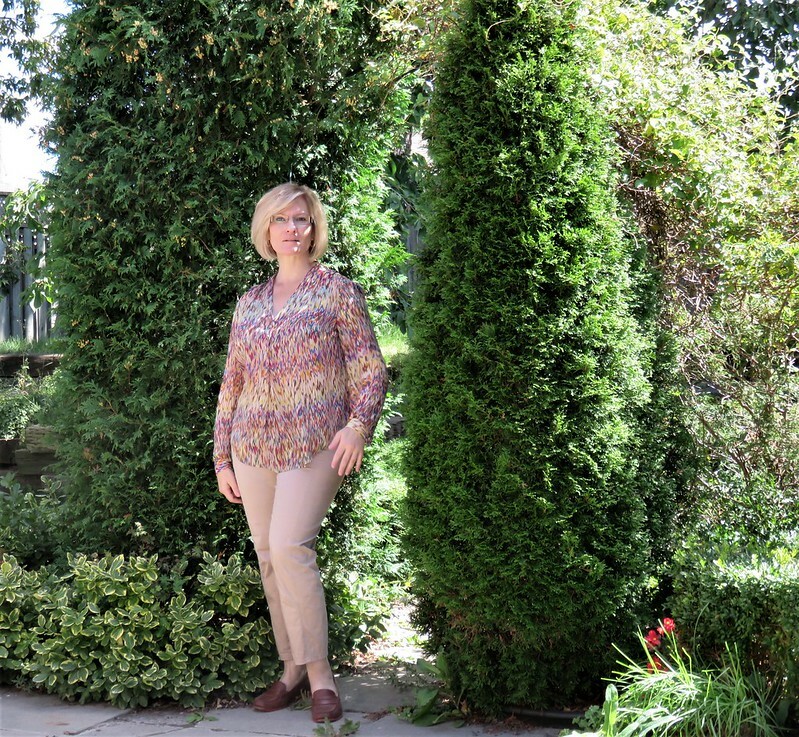 I made this blouse in a silk several years ago and it is one of my favorites. Only two reviews? That doesn’t make sense – it’s a gorgeous blouse. I would so totally buy it if I were in the market for a new blouse pattern! I absolutely loved the way it turned out for you too. Just lovely! On the hand hemming- I do it from right to left though, I find it easier! So do I… only I wish the stitches were more uniform!! Love it!! I was put off this pattern because the sleeve looked so narrow on pattern envelope. Looks lovely on you! I was a bit concerned about that, too, but after checking measurements on the pattern, found there was more than enough ease built in for comfortable movement. Every sleeve looks too small on models, I find. I love this, Tia. This is exactly the sort of blouse that I need in my wardrobe (and the v-neck is a nice feature for someone like me with a full bust). I have tons and tons of shirts but never make blouses. A great job on the details, too. The pants are also terrific.The colours are great and suit you so well. A whole slew of winners! Yes, I love the neckline, too. It’s the one reason I thought I’d give this pattern a go.